Re: Post your Weather Station's "New Record" here. Warmest September night A.V.G monthly of 5.79c in 2016. After all my moaning and groaning in the Weather Shout box it is now official. January 2017 is the driest January and driest month I have on record or have data access to. Needless to say it is extremely dry over here and our Fire Danger Levels are extreme. 25 consecitve days without rain. 25!!!! that is a long spell. I thought ours was bad enough. I need 18 plus to beat our record. Currently 15. The new number of days without rain for Bishopdale chch. Last rain was on the 8th November 2017 - December 12= 36days. 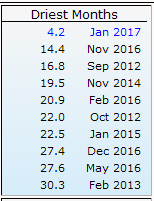 New record January 2018 high months avg air temperature For Bishopdale chch = 19.44c. The old record was in 19.15c in January 1998. Also new night avg temp record of 14.94c. The old record was 13c set in 1998. Daytime avg air temp was the 2nd warmest on record at 23.93c. The record for Bishopdale still stands at 25c in 2009. As at 15th December Wairoa, HB has had 15 wet days in a row breaking the record at this station. usually I have the sprinklers on the gardens every day but not this year.